Video game movies are, by reputation, bad. 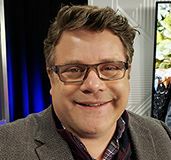 Over the past couple of decades, many have tried to bring popular video games to the big screen into some kind of cohesive story to varying degrees of failure. But 2016 is unique in that it gives us the most promising video game adaptations we’ve ever seen, one of which is 20th Century Fox’s long-in-the-works Assassin’s Creed. An adaptation of Assassin’s Creed has been in development for years, but it finally took flight when Michael Fassbender became involved as producer and star, and he made the project even more enticing by enlisting his Macbeth director Justin Kurzel to take the helm, who filled the cast out with Oscar-winner Marion Cotillard, Jeremy Irons, and Michael K. Williams, among others. So on paper, this thing sounded great. But what about in execution? Last fall, I had the pleasure of visiting the London set of Assassin’s Creed along with a small group of reporters, and boy did I come away convinced that we could be in for a treat. 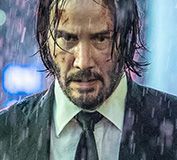 Kurzel is approaching the film with a strong emphasis on location shooting and jaw-dropping practical effects, with Kurzel and Fassbender both driven by the desire to highlight the strong themes of the video game franchise while taking the core storytelling nugget (ie. Templars vs. Assassins via DNA technology) and crafting something entirely of their own making. Fans of the game will find the set-up of Assassin’s Creed familiar: Fassbender stars as Callum Lynch, a Texas inmate on death row for murder who finds himself whisked away to the Abstergo facility in Spain, where Marion Cotillard’s Sofia Rifkken is conducting a series of experiments to try and identify where violence begins. Lynch is one of several patients at Abstergo, and he soon finds himself face to face with the Animus, a device that uses DNA technology to allow the user to experience the lives of past ancestors. Lynch is then regressed into the body of his 15th century ancestor Aguilar, an Assassin on the hunt for the all-important Artifact. But this being Assassin’s Creed and all, the Templars are intensely involved in ways that, at least at first, may be mysterious. I visited the set while production had moved to the 007 stage at Pinewood Studios, where they had built the massive Abstergo set. Most movie sets are broken up into pieces, so when a character opens a door and walks into another room, those rooms are usually two different sets that may not even exist at the same time. But Kurzel and producer designer Andy Nicholson wanted to do something different with Assassin’s Creed. The Abstergo set was built entirely connected, so that one could travel from the patient’s room (which is more like a prison cell) to a hallway to the recreation area to the corridor to the security room all in one go, without breaking the illusion. This allowed for Kurzel’s cinematographer Adam Arkapaw, who shot Macbeth as well as the first season of True Detective, to shoot a lot of long, unbroken takes. Keep in mind this is the guy responsible for capturing the incredible tracking shot in the first season of True Detective, then add in the fact that he’s shooting Assassin’s Creed freerunning and parkour. Exciting, right? 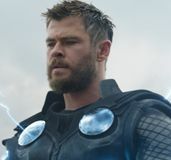 All of what we saw was incredibly promising, and while Kurzel and Fassbender may not be superfans of the video game franchise, they seem perfectly attuned to what aspects from the game will translate best to a feature film. This is what could make for a great video game movie, not a blind devotion to the source material. 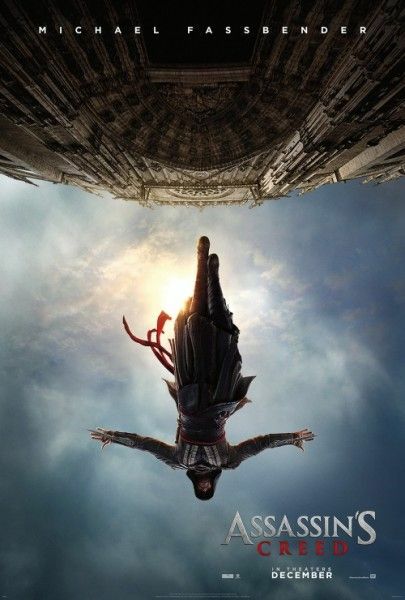 But fear not, Assassin’s Creed fans—there are plenty of Easter Eggs scattered throughout the film, and the spirit of the franchise’s romance for history remains intact. Below, I’ve compiled a list of key highlights I learned while visiting the set. 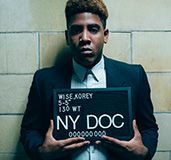 You’ll find info on production specifics, story and character details, the bevy of weapons included in the film, and much more. And for an even deeper dive, look for my interviews with Fassbender, Kurzel, and more on the site soon. Assassin’s Creed’s release date of December 21st cannot get here fast enough. If for some reason you haven’t watched the trailer yet, click here, and to read our on-set interview with Fassbender, click here. The past sequences take place in 1491 Spain, where Fassbender’s character is searching for the Artifact. Abstergo’s complex is hidden inside an old church in Spain, so the Abstergo set has exposed walls that make it look like it’s built within an old Spanish church. 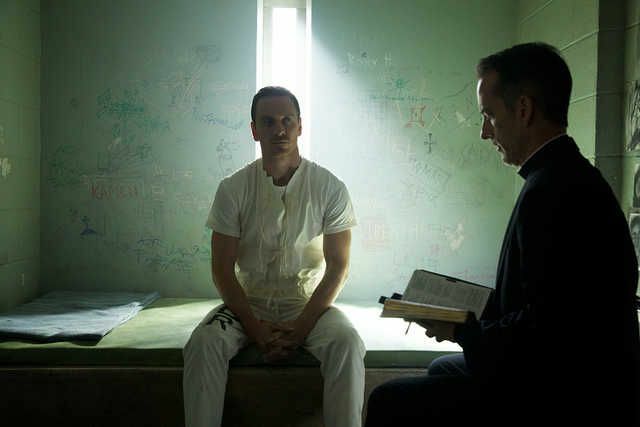 Fassbender’s character, Callum Lynch, was on death row for murder in Texas, but his execution was faked and he was whisked away to Spain. There are 30-40 other patients at Abstergo, and all of the main patients that Callum interacts with have ancestors from a time period in a previous Assassin’s Creed game. Callum travels back via the Animus more than twice during the movie. Marion Cotillard’s character is Sofia Rikken, who is running the Abstergo prison, trying to identify where violence begins and create treatments that eradicate violence in society. Jeremy Irons plays her father, who is the head of Abstergo and may or may not have more sinister motives. Callum sees Rikken as the Warden of the Abstergo facility. Production took place on the 007 stage at Pinewood Studios in London, which housed the Abstergo set. The Abstergo set was built so that as much of it as possible was connected for real, from the corridors to the recreation area to the individual cells, so that cinematographer Adam Arkapaw could shoot a lot of long, unbroken takes without a lot of cutting. They shot a recreation of the Spanish Inquisition. Fassbender is the only present day actor who appears in the past sequences in the film. The film is roughly 65% present day sequences, 35% regression sequences. The ancestor of Michael K. Williams’ character is based in voodoo and trickery, while Matias Varela’s ancestor is Yusef, a Middle Eastern assassin. Some of the present day characters exhibit powers and extraordinary abilities. 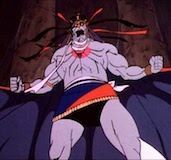 The bleeding effect is in the film as Cal sees a vision of his ancestor who teaches him fight moves. Eagle Vision is also an important part of the film. For the scenes on location in Malta, they had up to 900 extras in 15th century clothes. They changed the design of the Animus to make it more interactive for the actors, and Ubisoft liked it so much they may incorporate it into a future game. British freerunner Damien Walters served as Michael Fassbender’s stunt double for freerunning sequences. Sadly, there will be no scene of Fassbender jumping into a wheelbarrel of hay. They made 3,000 weapon props. Getting the wristblades to work for real while also looking pretty was really tough for the team, but they pulled it off. They treated the weapons like Easter Eggs, so weapons taken straight out of the games are scattered throughout the films. Connor Kenway’s bow from Assassin’s Creed III makes an appearance. Ubisoft gave the prop makers a Bible of every weapon ever made for the games that they could use as a guide. Even though the game wasn’t out yet, Justin Kurzel wanted to include a weapon from Assassin’s Creed: Syndicate, so Ubisoft obliged. Ubisoft didn’t make any specific requests with regards to which weapons needed to be included in the game. But they did request to keep some of the weapons after filming concluded. 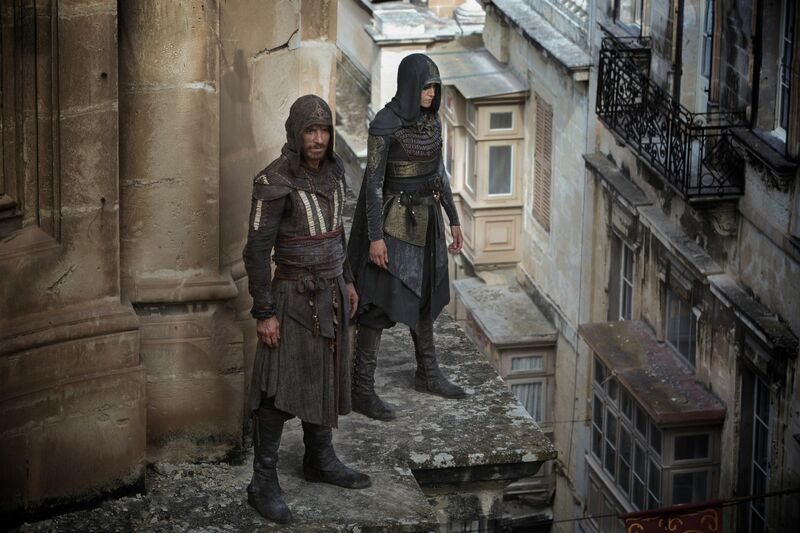 The Assassins costumes took 2-3 months to make and were all hand-crafted. 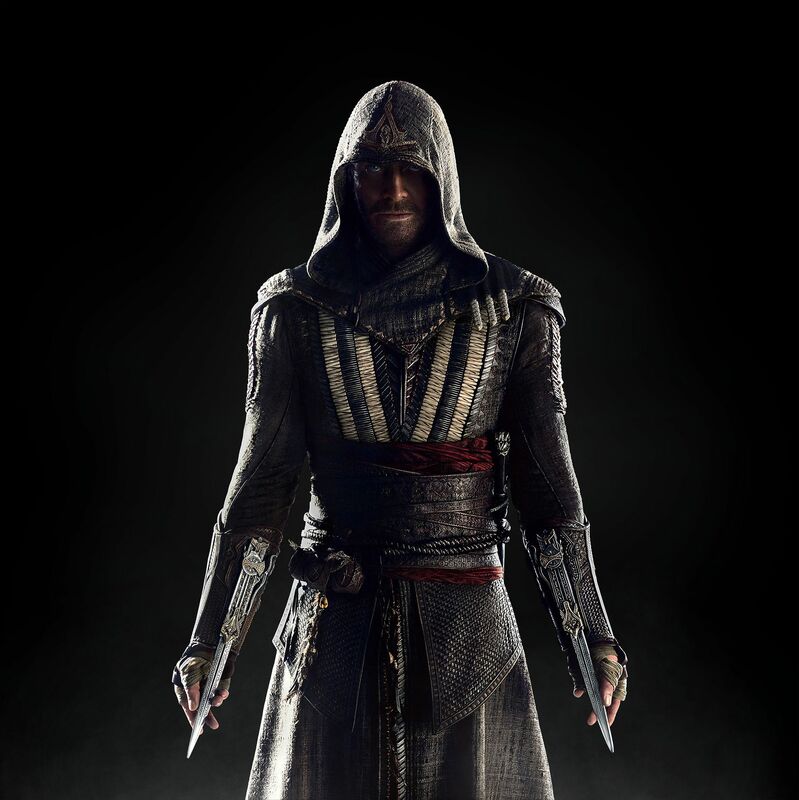 There are eight versions of each costume, with an entire costume team devoted to each of the Assassins. The toughest costume to create was Aguilar’s, because it had to be designed first in order to set their version of the Assassin. They wanted to differentiate the 15th century sequences from the present day sequences through color palettes, with the flashbacks taking on a more Earthy tone in contrast to the stark, sterile nature of present day. The costume designers had to construct the hoods so that they would maintain their point even while the actors were running around, which is tougher than it sounds. It took them 20-30 versions to create a hood that would look like the game and maintain its shape while the actor moved. 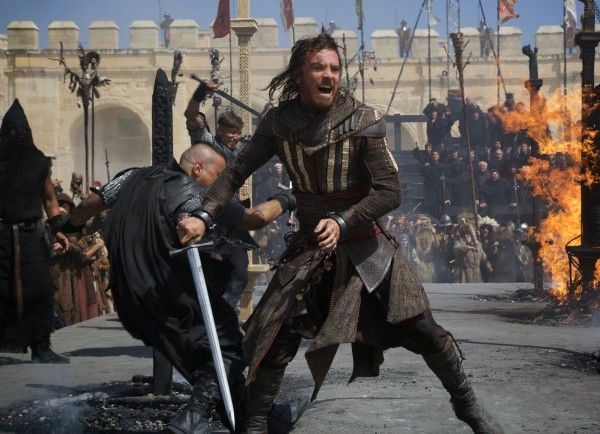 Fassbender was attracted to the game because he wanted to do a fantasy film that was rooted in science, and also thought the idea of Templars vs. Assassins was intriguing. Fassbender likens the themes of Assassin’s Creed to Star Wars in that there’s a dark side and a light side, and they’re both contradicting one another all the time. Filming took place over the course of 80 days. There was a strong emphasis on practical effects and doing as much in camera as possible, like having actors make a 30-meter leap for real. Kurzel didn’t want the movie to feel like a superhero film, he wanted to embrace “what it is to be human” through practical effects and parkour-intensive stunts. Production had to be completed by November 15th to make way for Star Wars: Episode VIII to take over the stage.